Acting on information developed by the Florida Fish and Wildlife Conservation Commission, on April 25, 2007 this reporter visited Duval County's Pope Duval Park on West Beaver Street in far western Duval County in search of Channeled Applesnails which reportedly had been found at that location. 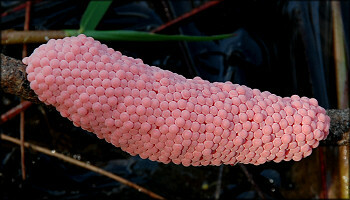 Like a majority of Channeled Apple snail populations found thus far within the state, the species at Pope Duval Park are believed to be Pomacea maculata. Due to the size of the park and the number of water bodies present, considerable searching was necessary but ultimately the snails were located in one of the park's lakes where a number of empty Pomacea shells and freshly deposited egg clutches were readily visible. A modest number of living specimens of various sizes were subsequently located. 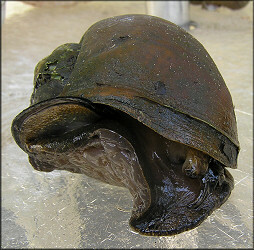 Empty Pomacea shells were also found in a nearby second smaller shallow lake suggesting that the species was present there as well. 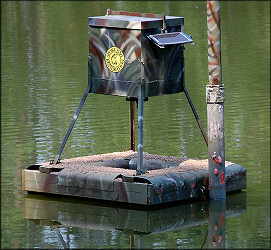 A return visit was made to the park on May 4, 2007 and a modest number of fresh Pomacea egg clutches were found in the second nearby lake thus confirming that a viable breeding population was present there as well. Also during this visit, a small weedy drainage ditch/creek that runs north-south through the park was also investigated and both living Pomacea and many empty shells were found. 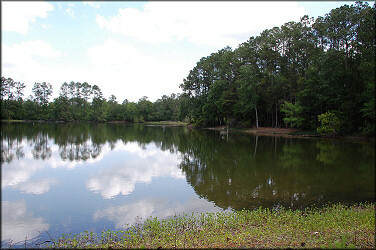 Available information indicates that this ditch/creek flows north through the park and there is no hydraulic connection to the park's east and west lakes. Because of extremely dense vegetation, no attempt was made to determine the extent of this Pomacea population. On June 25, 2007 the ditch/creek (also known as Brandy Branch) north of and outside of the park (downstream) was investigated. Numerous live and empty Pomacea shells were were found adjacent to the concrete box culvert where West Beaver Street spans the ditch/creek as well as a modest number fresh egg clutches. Utilizing a nearby private road, the ditch/creek was investigated for an additional distance of 425 yards north of the park/West Beaver Street and Pomacea egg clutches were seen throughout the entire distance. Because of access limitations, it could not be determined exactly how far north of the park the Pomacea have colonized the ditch/creek. However, their spread would appear to be limited only by the number of years that they have been physically present in this habitat. 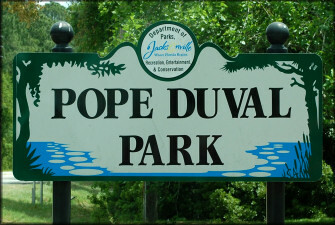 Pope Duval Park is the third location within Duval County where exotic Channeled Apple Snails have been found. However, based on DNA sequencing, the snails present at the two previously known locations are believed to be Pomacea canaliculata (Lamarck, 1822) and not Pomacea maculata.